Traumatic aortic disruption is a time-sensitive injury requiring rapid and accurate diagnosis to prevent death. Although the clinical, or mechanism, score is of primary importance in the prompt diagnosis of patients with traumatic aortic injury (TAI), the radiologic findings play a vital supportive role. However, no ideal diagnostic algorithm is currently available for TAI. Examples of TAI are shown below. Aorta, trauma. CT scan shows aortic disruption at the aortic isthmus. Increased attenuation is present in the mediastinum; this indicates hematoma and a left pleural effusion. The linear lucency across the aortic lumen may be an artifact. The pseudoaneurysm is not seen on this image. Aorta, trauma. Left anterior oblique (45°) angiogram shows aortic disruption at the aortic isthmus. An irregular outpouching is present with an intimal flap and an angular transition that represents a contained disruption at the isthmus. This appearance is in contrast to the otherwise normal-appearing vessels. Aorta, trauma. Left anterior oblique (45°) angiogram shows disruption of the innominate artery. A fairly well-contained pseudoaneurysm originates near the innominate artery. Aorta, trauma. Posteroanterior angiogram shows disruption of the innominate artery. This delayed image shows continuing expansion of the extravasation of contrast material. The outer margins of the pseudoaneurysm are better delineated on this image than on others. Aorta, trauma. Left anterior oblique (45°) angiogram shows disruption of the innominate artery. 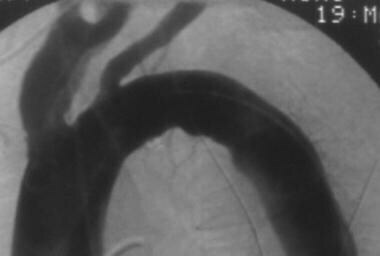 A well-circumscribed narrow-neck pseudoaneurysm is noted along the superior margin of the aortic isthmus. The findings suggest a daughter injury immediately distal to the main outpouching. Aorta, trauma. Posteroanterior angiogram shows multiple great-vessel injuries. The image shows a cut-off of the left vertebral artery and a pseudoaneurysm of the left subclavian artery. The right common carotid artery is also occluded. The occlusions are probably due to intimal flap ballooning into the vessel lumen that occludes it. Aorta, trauma. Image shows the contour deformity and the calcified rim of a chronic posttraumatic aortic pseudoaneurysm. Aorta, trauma. The image shows the intimal irregularity and intraluminal thrombus of the distal abdominal aorta and the proximal common iliac arteries. This obese patient had a seat-belt injury to the abdominal aorta. Physical examination showed significant ecchymosis of the abdomen. 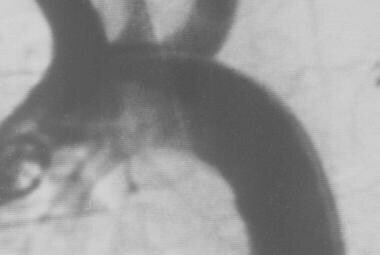 Radiographs showed blurring of the psoas margin with displacement of the ureters. TAI syndrome is initially characterized by contained rupture (pseudoaneurysm), which is relatively clinically silent. After a variable period of time, contained rupture is followed by a rapid transition to free, uncontained pseudoaneurysm rupture; exsanguination; and death. The clinical challenges are to rapidly stabilize the patient and evacuate him/her to a level I trauma center for evaluation, diagnosis, and definitive treatment before free rupture occurs. Plain radiography is usually the first test to be performed. The optimal upright posteroanterior (PA) chest evaluation is often deferred for a portable examination with the patient still on the backboard. Diagnostic imaging should be deferred in patients presenting in hypovolemic shock or cardiac arrest. Advanced (64-slice and greater) spiral CT can produce near-angiographic quality images, and when available, it should be considered the diagnostic procedure of choice for TAI. Angiography is appropriate in cases where endovascular intervention (eg, stent-graft) is contemplated. Except in cases involving exsanguinating hemorrhage from a pelvic fracture, angiography has no role in the early treatment of a patient with polytrauma who is in unstable condition. Magnetic resonance imaging (MRI) generally has no role in the acute evaluation of polytrauma. Some centers advocate the early use of transesophageal echography, which is beyond the scope of this discussion. Aorta, trauma. 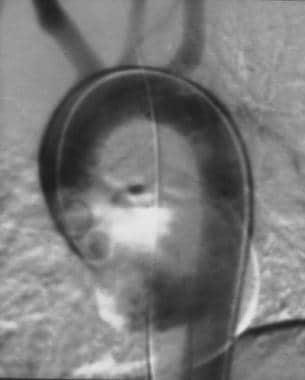 Chest radiograph shows a chronic isthmus pseudoaneurysm, which is demonstrated as a smooth outpouching near the aortic knob. 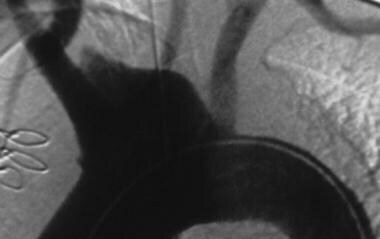 The calcified rim indicates that this injury is several years old. Aorta, trauma. Chest radiograph shows a focal isthmus pseudoaneurysm. The superior mediastinum is distorted, with a loss of the normal aortic knob contour. 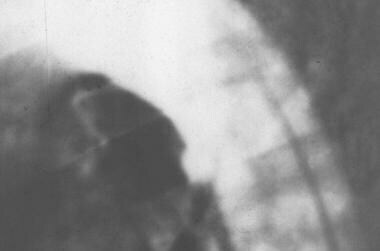 The right mediastinal edge is blurred as well. Although not measured, the mediastinum is also wide. Aorta, trauma. Chest radiograph shows an isthmus tear and atherosclerosis in a 79-year-old man. 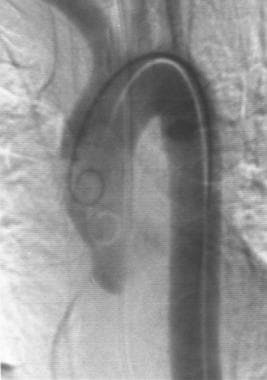 Image shows blurring of the aortic knob with a double shadow. 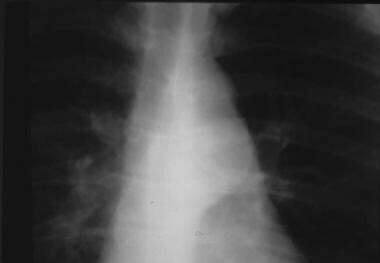 The extensive subcutaneous emphysema probably related to another injury. 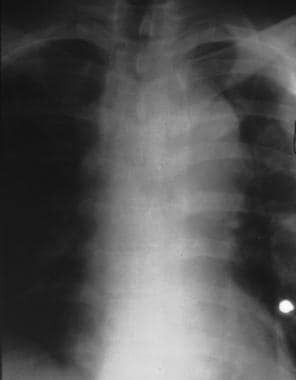 Blunt aortic trauma (BAT) has several classic radiographic signs. These signs are more a result of multiple injuries or the radiographic technique used and less a specific sign of BAT. 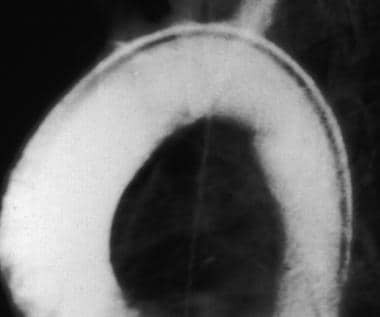 Regarding the well-known sign of mediastinal widening, some trauma radiologists believe that the mediastinal contour is a better indication of BAT than is the transverse diameter. Diagnoses such as masses, infection, and chronic injury may simulate acute traumatic aortic injury. Stark et al reviewed the CXR results in 49 cases of aortic rupture and found that a widened mediastinum, partial blurring of the aortic shadow, a left apical cap, and right tracheal deviation were the most common findings. No patient in the study had normal CXR results. Unfortunately, those findings are often nonspecific, and they can be present in patients without significant aortic injury. Therefore, clinical evaluation is essential in determining which patients require further studies. Aorta, trauma. 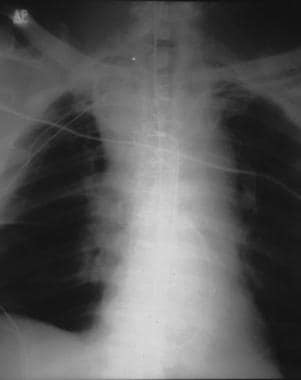 Chest radiograph shows widening of the mediastinal contour and deformity and blurred margins of the superior mediastinum. Aorta, trauma. 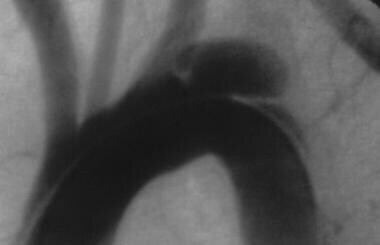 Chest radiograph shows a circumferential isthmus rupture. The aortic knob is not depicted, and the mediastinum is wide and deformed. The table below shows the poor predictive value of the classic CXR signs of TAI. Traumatic aortic injury (TAI) may be diagnosed from CT scans on the basis of direct or indirect signs. Direct signs (eg, aortic intimal flap, contour abnormality) are more accurate than indirect signs (eg, mediastinal, periaortic hematoma). Aorta, trauma. CT scan shows a focal isthmus pseudoaneurysm. 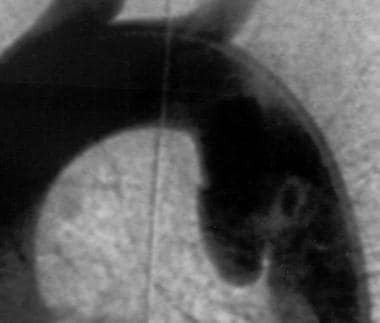 The image shows increased attenuation of the mediastinum, which is consistent with mediastinal hematoma. The descending aortic contour is bilobed, consistent with pseudoaneurysm formation. The advantages of CT scanning are that it is quick, noninvasive, useful in evaluating multiple traumas at the same time, and capable of providing a larger field of interest, particularly with fast spiral technology. The days of conventional angiography as the criterion standard for the evaluation of blunt arterial trauma (BAT) are likely numbered. [18, 19, 20] The historic tradeoff between CT scanning and angiography was image resolution versus cross-sectional imaging. The submillimeter resolution available with angiography (cut-film and then digital subtraction angiography [DSA]) was invaluable for delineating the sometimes subtle findings of traumatic aortic disruption. CT scanning times were long, and sections were thick. Moreover, the intravascular density of contrast material on CT scans was far less than that which is currently achievable. False-negative results could occur with subtle injuries. False-positive CT scan findings were possible with mediastinal hemorrhage from venous bleeding and irregularities of the vessel wall due to atherosclerosis. Technologic improvements are, however, a double-edged sword. With decreasing section thickness comes a commensurate increase in the number of images to be interpreted. Examinations involving 600-800 individual sections are possible. High-speed diagnostic workstations can help in managing the data load. With these workstations, reviewers can rapidly scroll through high-resolution datasets and combine the data into fewer, thicker sections. Another data-management tool brings diagnosis full circle to the angiographic interpretation of BAT images. Cross-sectional imaging may be processed with 3-dimensional (3D) and 2-dimensional (2D) surface reconstruction techniques. These reconstruction techniques produce images that simulate anatomic dissections and angiograms. The images allow the clinician to obtain an examination overview and to focus on particular areas of pathology or surgical interest. As technology improves, reconstructed images will eventually supplant source images in routine image interpretation. The imaging endpoints of reconstructed CT scans and conventional angiograms are essentially similar. Similar interpretation approaches are likely to apply. Angiographic signs and interpretation skills should have significant overlap with the evaluation of CT angiograms. The disadvantages of CT scanning are as follows: (1) CT scanning may be limited by partial-volume effects (eg, those due to small disruption or subtle intimal injury), (2) cardiac and respiratory motion (eg, artifact in the region of the aortic root) can affect the image quality, and (3) CT scanning can expose the patient to contrast material, particularly if angiography and/or embolization are required. These disadvantages are minimized with modern scanner technology. Studies have shown that CT scanning is sensitive for TAI (83-100%) and that it has a negative predictive value (NPV) of 99-100%. Its specificity of 54-99.8% and its related positive predictive value (PPV) of 9-89% are generally lower than those of angiography. Further study is needed before the field of CT scanning in traumatology is considered mature. Most of the studies that show a 100% NPV for CT scanning is limited to clinical follow-up. Data about follow-up CT or angiography in patients with negative initial CT scan findings are limited. However, in a study of blunt trauma patients that included 72 patients who underwent CT angiography (CTA) followed by catheter angiography, Sammer et al found that when CTA findings are indeterminate (ie, showing mediastinal hematoma without direct evidence of aortic or intrathoracic great vessel injury), conventional angiography is unlikely to show an aortic or intrathoracic great vessel injury and may be unnecessary. In this study, isolated mediastinal hematoma on CTA had an NPV of 100% for aortic or intrathoracic great vessel injury. A number of investigators recommend CT scanning as the screening examination of choice for TAI as well as for other injuries (eg, pulmonary laceration, pneumothorax, tracheobronchial injury, spinal injury). Unless the CT scan results are diagnostic, confirmatory angiography is generally required. 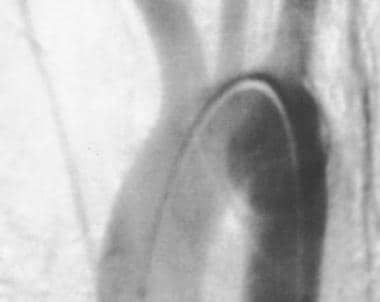 Because of the nearly 100% sensitivity and specificity of helical CT scanning, this modality has largely replaced aortography in the diagnosis of TAI in adults and children. Atelectasis, the thymus, or the pericardial recess can mimic mediastinal hematoma. Ductus diverticulum or other variants may be confused with traumatic aortic injury (TAI). 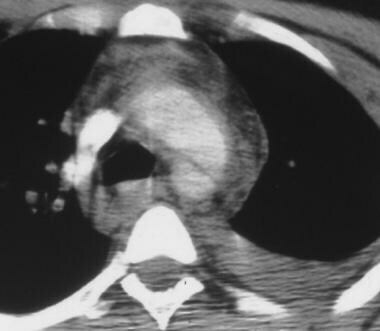 Mediastinal hematoma may be due to venous or arterial injury. Subtle ruptures, particularly intimal injuries, may not be clearly delineated. Nevertheless, authors of published reports speak highly of CT evaluation. Partial-volume and cardiorespiratory motion effects can lead to false-positive or false-negative findings, particularly in the region of the aortic root. Studies have shown improved results with CT scanning. Various grading schemes have been described, and these are likely to address the false-positive issue. Transesophageal echography (TEE) for the diagnosis of traumatic aortic injury has its proponents, who support the modality mostly because of its portability and rapid availability in a trauma center setting. TEE has significant proponents in the pediatric trauma literature. Intravascular ultrasonography is very helpful in identifying traumatic intimal flaps when CTA and aortographic findings are inconclusive in the diagnosis of aortic injuries. Limitations of the modality include blind spots where the aorta is suboptimally imaged with ultrasonography. Like angiography, TEE is operator and reader dependent and must be performed by well-trained personnel. 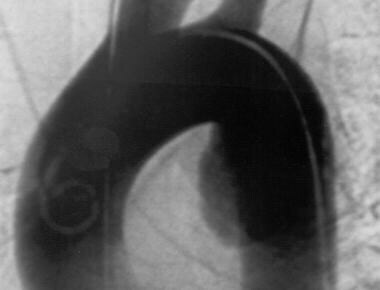 Thoracic aortography may be performed with a standard 100-cm-long 5F pigtail catheter, although a 110-cm-long 6F pigtail (Merit Medical Systems, South Jordan, Utah) is preferred. The longer length is helpful for reaching the aortic root in tall patients. With the 6F catheter, the 27-mL/s contrast-agent injection rate typical of 100-cm-long 5F catheters can be exceeded. The 6F pigtail may be more rigid than 5F catheters. Predilation of the tract with a 5F or 6F dilator or a 6F sheath is recommended. 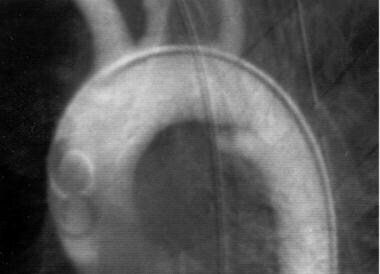 The imaging rate of thoracic aortography is 4-6 frames/sec on deep inspiration. Angiograms of aortic trauma in the region of the isthmus appear below. Aorta, trauma. 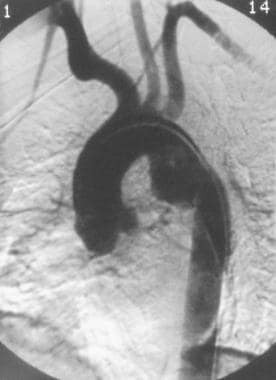 Image shows a chronic isthmus pseudoaneurysm, which is indistinguishable from the acute variety. The calcium seen on plain radiographs is not readily seen on digital subtraction angiograms (DSAs). Aorta, trauma. Posteroanterior angiogram shows a focal isthmus pseudoaneurysm. A fairly sharply demarcated, rounded, doubly dense region is seen superimposed on the isthmus area. Its differentiation from a normal ductus may be difficult. Aorta, trauma. Left anterior oblique (45°) angiogram shows a focal isthmus pseudoaneurysm. Image shows delayed washout from the slightly irregular isthmus bulge that supports the diagnosis of pseudoaneurysm. The remainder of the aorta is smooth in this 19-year-old male patient. Aorta, trauma. Posteroanterior (PA) angiogram shows a subtle intimal flap. Only a hint of the intimal flap at the anteromedial isthmus is depicted in this 31-year-old man. The angiographic findings are otherwise normal. Aorta, trauma. Left anterior oblique (30°) angiogram shows a subtle intimal flap. 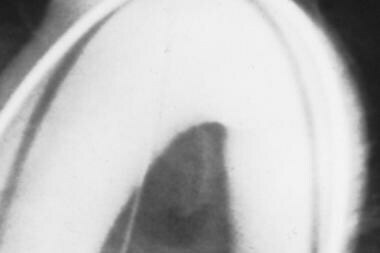 Image demonstrates a focal anteromedial isthmus bulge with the intimal flap shown to better advantage. Aorta, trauma. Posteroanterior angiogram shows a subtle isthmus tear in a 21-year-old man. On this view, the anteromedial isthmus abnormality is subtly demonstrated as a round, superimposed density in this otherwise unremarkable study. Aorta, trauma. Posteroanterior (PA) angiogram shows a subtle circumferential isthmus tear in a 72-year-old man. Image demonstrates the mildly irregular lateral surface of the aortic isthmus. This abnormality could easily be confused with atherosclerosis. Aorta, trauma. Posteroanterior (PA) angiogram shows an anteromedial isthmus rupture in a 19-year-old man. Image shows an anteromedial bulge with a slightly irregular contour and a suggestion of an acute-angle transition with the aortic wall. This appearance might be confused with that of a ductus diverticulum. Aorta, trauma. 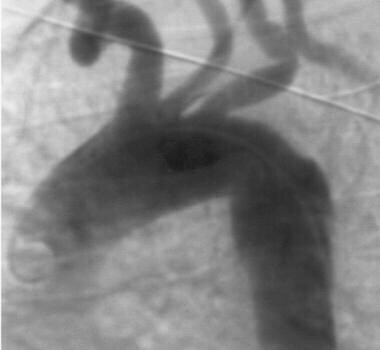 Angiogram shows a circumferential isthmus rupture. The surface irregularity, contour abnormality, and acute angulation of the transition make this diagnosis easy. Aorta, trauma. 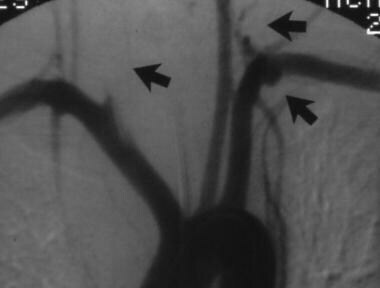 Left anterior oblique angiogram shows an isthmus tear and atherosclerosis. Although the appearance of the surrounding and underlying atherosclerosis confuses the diagnosis, a definite focal bulge at the anteromedial isthmus is noted. This was proven to be a traumatic aortic injury (TAI). Aorta, trauma. 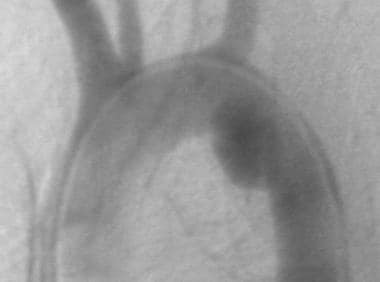 Left anterior oblique (60°) angiogram shows atherosclerosis without an aortic injury. No focal variation in the atherosclerotic pattern is present to suggest injury. Aorta, trauma. 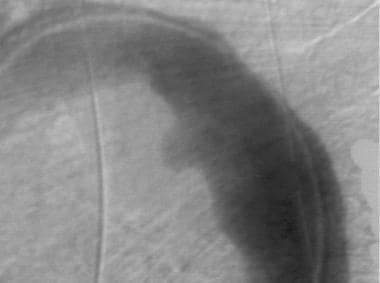 Angiogram shows a chronic circumferential isthmus rupture. The appearance should not be confused with that of the normal fusiform dilation in the previous image. Note the acute angles of the transition and the irregular margins. This patient was 9 years old and was involved in a motor vehicle accident. Aorta, trauma. Lateral digital subtraction angiogram shows a subtle isthmus pseudoaneurysm. This image better demonstrates the irregular contour and the right-angle transition of the pseudoaneurysm. Aorta, trauma. Lateral screen-film angiogram shows a subtle isthmus pseudoaneurysm. Conventional subtraction image demonstrates the irregular contour of the isthmus rupture. The image also suggests a linear defect of the intimal flap. Surgical exploration confirmed subtle aortic injury. CT scan of the aortic arch (not shown) showed no abnormality in the region of the traumatic pseudoaneurysm that was demonstrated on the angiogram. Although most traumatic aortic injuries occur in the region of the isthmus, the entire thoracic aorta should be evaluated. To exclude aortic regurgitation and other aortic root injury, the catheter is first placed above the sinuses of Valsalva. A test injection is used to verify that the catheter tip does not interfere with the aortic root, to avoid spurious aortic regurgitation (see the image below). The contrast-agent injection rate is 20- to 30-mL/s for 50 mL, depending on the patient's cardiac output. Patients with blunt aortic trauma (BAT) are typically young and present in a state of high cardiac output. Aorta, trauma. 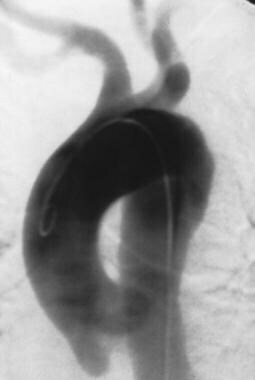 Angiogram shows a spurious aortic regurgitation. The pigtail catheter is placed too close to the aortic valves (sinuses of Valsalva) and interferes with normal valvular function and regurgitation. Repeat angiogram obtained after the catheter was repositioned showed normal findings. The position of the catheter should be verified with a vigorous test injection. The injection and imaging rate may be adjusted on the basis of the test injection results. For intubated patients, mechanical ventilation may be suspended during each angiographic run. Once the aortic root and the ascending aorta are cleared, the catheter may then be withdrawn to the upper ascending aorta to concentrate on the isthmus and distal aorta. The side holes of the catheter should be positioned just proximal to the area of interest for maximum opacification. Aortographic signs of aortic rupture may be subtle. A minimum of 2 angiographic projections is required to exclude traumatic aortic injury (TAI). Typical projections are a 45° left anterior oblique (LAO) view followed by a steep LAO or lateral view (see the images below). When an isthmus abnormality is suspected, obtain a lateral or steep LAO view to differentiate between the contour abnormality of a pseudoaneurysm and a normal ductus. Other projections are obtained depending on clinical suspicion and the preliminary angiographic findings. In one case from the author's experience, a rupture was better seen on the PA image than on the shallow oblique image (no steep oblique or lateral image had been obtained). Aorta, trauma. 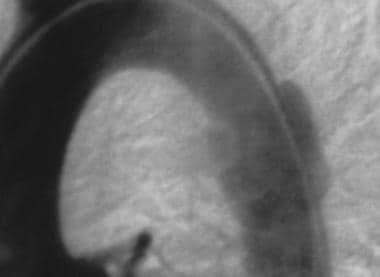 Left anterior oblique (45°) angiogram shows a subtle isthmus tear. This digital subtraction angiogram clearly demonstrates the focal bulge of a pseudoaneurysm, with a linear defect of the intimal flap shown superiorly. Aorta, trauma. 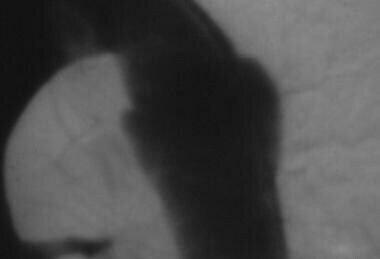 Left anterior oblique (45°) digital subtraction angiogram shows a subtle circumferential isthmus tear. The findings confirm the irregularity, and the image shows a focal bulge with a sharply angled superior transition. Aorta, trauma. Left anterior oblique (45°) digital subtraction angiogram shows an anteromedial isthmus rupture. 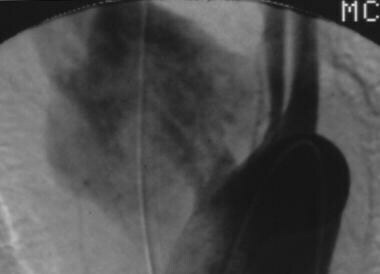 Image clearly demonstrates the linear defect of an intimal flap, which confirms the diagnosis of an aortic rupture. Aorta, trauma. Left anterior oblique (45°) angiogram shows a circumferential isthmus rupture. Irregularity and acute angulation are noted in this acute traumatic aortic injury (TAI). Aorta, trauma. Left anterior oblique (45°) angiogram shows a circumferential isthmus rupture. The contour of the proximal margin of the pseudoaneurysm is shown in relief against the adjacent aorta. Aorta, trauma. Left anterior oblique (45°) angiogram shows a normal aorta with a fusiform isthmus and atherosclerosis. No abnormality is superimposed over the normal variant fusiform appearance of the isthmus and the typical appearance of atherosclerosis. Aorta, trauma. Left anterior oblique (45°) digital subtraction angiogram shows a subtle isthmus pseudoaneurysm. The image shows a slightly asymmetrical anteromedial bulge that might represent a small ductus diverticulum. Biplane imaging or rotational angiography can reduce the examination time and the contrast agent load. A biplane combination of 45° right anterior oblique (RAO) and/or LAO views may be used. The imaging frame rate, the source-to–image intensifier distance (SID), and the projection may be altered to accommodate tube loading, kilovolt-peak issues, or cardiac output. A typical frame rate is 4-6 per second. DSA magnification may be helpful in equivocal cases. Tube-loading limits may become significant for steep oblique or lateral magnified studies. 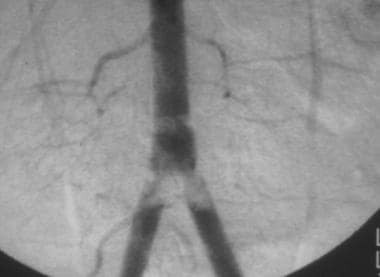 Rotational angiography typically increases tube loading. Whenever tube loading becomes an issue, the traditional steps may be taken, that is, a reduction in the frame rate and the duration of the examination, in the SID, in the magnification, or in the dose (increased DSA quantum mottle). Angiography is the traditional modality for evaluating patients with suspected acute TAI. Approximately 10-20% of patients with blunt trauma who are referred for angiography have positive angiographic findings. In BAT, angiography is best used as a confirmatory tool for patients with positive CT scan findings or as a primary diagnostic tool in hemodynamically stable patients in whom the clinical suspicion for TAI is high. A high index of suspicion is required when a patient is evaluated for TAI. The mortality rate for a missed diagnosis (false-negative angiographic finding) is high. Equivocal cases should undergo close clinical and imaging follow-up or exploratory surgery. Surgery is a relatively benign procedure when the risk of morbidity and mortality associated with a missed TAI is considered. As the quality of CT and other noninvasive imaging modalities improve, the surgical exploration rate can be expected to decrease. False diagnoses can be minimized by paying meticulous attention to the imaging technique and by following up any equivocal findings. False-negative angiographic results may occur when the injury is subtle, when it is not seen in profile (out of plane), or when the injured area is not delineated by the contrast agent column or when it is out of the field of view. False-positive angiographic results (examples of which appear below) may occur as a result of inadequate angiographic technique (catheter position, injection rate, exposure and position), motion or inflow artifacts, comorbidities (eg, atherosclerosis), the presence of nontraumatic entities (eg, infection), and normal variants in the anatomy. Aorta, trauma. Left anterior oblique angiogram shows a normal fusiform aortic isthmus. Angiogram shows smooth, fusiform widening of the isthmus with a smooth transition at an obtuse angle with the descending aorta. No persistence of contrast opacification is shown. This 31-year-old patient was referred for surgery, and a normal aorta was found. The angiographic findings were false-positive. In the author's experience, subsequent patients with similar findings have not been referred for thoracotomy, and they have not developed signs or symptoms of aortic rupture. Aorta, trauma. Left anterior oblique (20°) angiogram shows an acute widening in the anteromedial isthmus region, with linear enhancement projecting superomedially. This 40-year-old man underwent surgical exploration, with negative results. The finding was retrospectively identified as a normal bronchointercostal artery. Common variants at the isthmus are a smooth, fusiform, circumferential widening at the isthmus; a ductus diverticulum; and an asymmetrical ductus with bronchointercostal artery (see the image below). No other signs of TAI should be present if a normal variant is to be safely diagnosed. Shergill AK, Maraj T, Barszczyk MS, Cheung H, Singh N, Zavodni AE. Identification of Cardiac and Aortic Injuries in Trauma with Multi-detector Computed Tomography. J Clin Imaging Sci. 2015. 5:48. [Medline]. Mokrane FZ, Revel-Mouroz P, Saint Lebes B, Rousseau H. Traumatic injuries of the thoracic aorta: The role of imaging in diagnosis and treatment. Diagn Interv Imaging. 2015 Jul-Aug. 96 (7-8):693-706. [Medline]. Ait Ali Yahia D, Bouvier A, Nedelcu C, Urdulashvili M, Thouveny F, Ridereau C, et al. Imaging of thoracic aortic injury. Diagn Interv Imaging. 2015 Jan. 96 (1):79-88. [Medline]. Giambuzzi M, Seitun S, Salsano A, Passerone G, Ferro C, Santini F. Nongated vs electrocardiography-gated CT imaging of blunt aortic root rupture in a trauma patient. J Cardiovasc Comput Tomogr. 2015 Mar-Apr. 9 (2):146-8. [Medline]. Creasy JD, Chiles C, Routh WD, Dyer RB. Overview of traumatic injury of the thoracic aorta. Radiographics. 1997 Jan-Feb. 17(1):27-45. [Medline]. Fisher RG, Sanchez-Torres M, Thomas JW, Whigham CJ. Subtle or atypical injuries of the thoracic aorta and brachiocephalic vessels in blunt thoracic trauma. Radiographics. 1997 Jul-Aug. 17(4):835-49. [Medline]. Haesemeyer SW, Gavant ML. Imaging of acute traumatic aortic tear in patients with an aberrant right subclavian artery. AJR Am J Roentgenol. 1999 Jan. 172(1):117-20. [Medline]. Lipchik EO, Robinson KE. 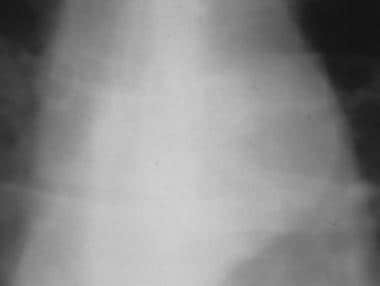 Acute traumatic rupture of the thoracic aorta. Am J Roentgenol Radium Ther Nucl Med. 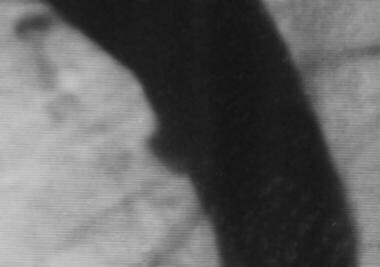 1968 Oct. 104(2):408-12. [Medline]. Lowe LH, Bulas DI, Eichelberger MD, Martin GR. Traumatic aortic injuries in children: radiologic evaluation. AJR Am J Roentgenol. 1998 Jan. 170(1):39-42. [Medline]. Patel NH, Stephens KE Jr, Mirvis SE, et al. Imaging of acute thoracic aortic injury due to blunt trauma: a review. Radiology. 1998 Nov. 209(2):335-48. [Medline]. Zinck SE, Primack SL. Radiographic and CT findings in blunt chest trauma. J Thorac Imaging. 2000 Apr. 15(2):87-96. [Medline]. Stark P, Cook M, Vincent A, Smith DC. Traumatic rupture of the thoracic aorta. A review of 49 cases. Radiologe. 1987 Sep. 27(9):402-6. [Medline]. Kirsh MM, Behrendt DM, Orringer MB, et al. The treatment of acute traumatic rupture of the aorta: a 10-year experience. Ann Surg. 1976 Sep. 184(3):308-16. [Medline]. Kadir S. Diagnostic Angiography. Philadelphia: W.B. Saunders Co;. 1986: 124-71. Demetriades D, Gomez H, Velmahos GC, et al. Routine helical computed tomographic evaluation of the mediastinum in high-risk blunt trauma patients. Arch Surg. 1998 Oct. 133(10):1084-8. [Medline]. Ekeh AP, Peterson W, Woods RJ, Walusimbi M, Nwuneli N, Saxe JM, et al. 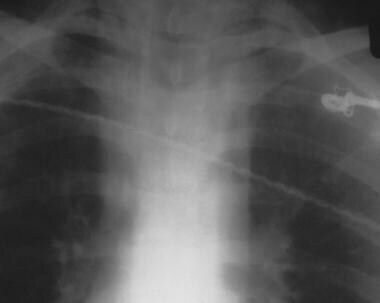 Is chest x-ray an adequate screening tool for the diagnosis of blunt thoracic aortic injury?. J Trauma. 2008 Nov. 65(5):1088-92. [Medline]. Fattori R, Russo V, Lovato L, Di Bartolomeo R. Optimal management of traumatic aortic injury. Eur J Vasc Endovasc Surg. 2009 Jan. 37(1):8-14. [Medline]. Ketai L, Brandt MM, Schermer C. Nonaortic mediastinal injuries from blunt chest trauma. J Thorac Imaging. 2000 Apr. 15(2):120-7. [Medline]. Van Hise ML, Primack SL, Israel RS, Muller NL. CT in blunt chest trauma: indications and limitations. Radiographics. 1998 Sep-Oct. 18(5):1071-84. [Medline]. Steenburg SD, Ravenel JG, Ikonomidis JS, Schönholz C, Reeves S. Acute traumatic aortic injury: imaging evaluation and management. Radiology. 2008 Sep. 248(3):748-62. [Medline]. Methodius-Ngwodo WC, Burkett AB, Kochupura PV, Wellons ED, Fuhrman G, Rosenthal D. The role of CT angiography in the diagnosis of blunt traumatic thoracic aortic disruption and unsuspected carotid artery injury. Am Surg. 2008 Jul. 74(7):580-5; discussion 585-6. [Medline]. Fishman JE, Nunez D Jr, Kane A, et al. Direct versus indirect signs of traumatic aortic injury revealed by helical CT: performance characteristics and interobserver agreement. AJR Am J Roentgenol. 1999 Apr. 172(4):1027-31. [Medline]. Mirvis SE, Shanmuganathan K, Miller BH, et al. Traumatic aortic injury: diagnosis with contrast-enhanced thoracic CT-- five-year experience at a major trauma center. Radiology. 1996 Aug. 200(2):413-22. [Medline]. Sammer M, Wang E, Blackmore CC, Burdick TR, Hollingworth W. Indeterminate CT angiography in blunt thoracic trauma: is CT angiography enough?. AJR Am J Roentgenol. 2007 Sep. 189(3):603-8. [Medline]. [Full Text]. Steenburg SD, Ravenel JG. Acute traumatic thoracic aortic injuries: experience with 64-MDCT. AJR Am J Roentgenol. 2008 Nov. 191(5):1564-9. [Medline]. Pate JW, Gavant ML, Weiman DS. 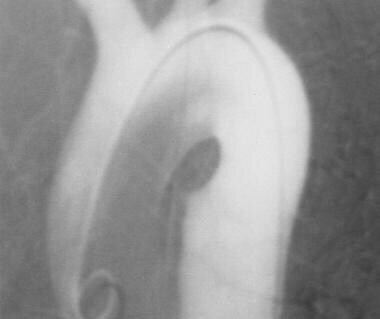 Traumatic rupture of the aortic isthmus: program of selective management. World J Surg. 1999 Jan. 23(1):59-63. [Medline]. Ahrar K, Smith DC, Bansal RC, et al. Angiography in blunt thoracic aortic injury. J Trauma. 1997 Apr. 42(4):665-9. [Medline]. Gavant ML, Menke PG, Fabian T, et al. 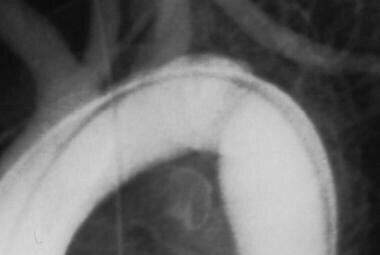 Blunt traumatic aortic rupture: detection with helical CT of the chest. Radiology. 1995 Oct. 197(1):125-33. [Medline]. Fabian TC, Davis KA, Gavant ML, et al. Prospective study of blunt aortic injury: helical CT is diagnostic and antihypertensive therapy reduces rupture. Ann Surg. 1998 May. 227(5):666-76; discussion 676-7. [Medline]. Aorta, trauma. Posteroanterior angiogram shows disruption of the innominate artery. This early image shows a poorly circumscribed pseudoaneurysm or extravasation. Aorta, trauma. 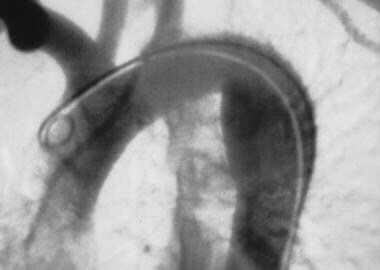 Left anterior oblique angiogram (LAO) shows the typical appearance of the normal ductus diverticulum. The smooth walls and transition would be better delineated on a steep LAO or lateral view (not shown). Aorta, trauma. 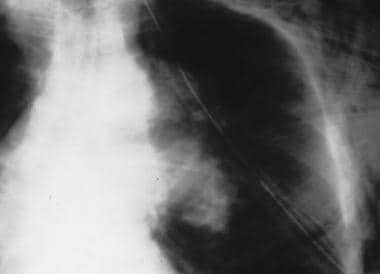 Chest radiograph shows spontaneous rupture of the isthmus, a mycotic aneurysm secondary to Salmonella pneumonitis infection. The widening and distortion of the superior mediastinum is indistinguishable from a traumatic pseudoaneurysm. This patient had no history of significant trauma and presented with chest pain. At surgery, a necrotic node was found, and Salmonella organisms were cultured. A faint bronchogram was noted retrospectively. Aorta, trauma. CT scan shows spontaneous rupture of the isthmus, a mycotic aneurysm secondary to Salmonella pneumonitis infection. Increased attenuation in the mediastinum is indistinguishable from a hematoma. 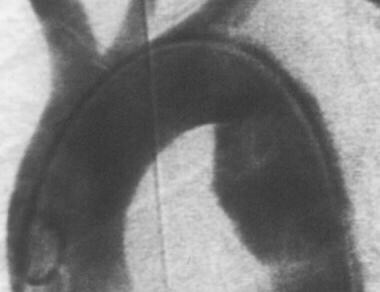 The calcified outpouching of the aorta suggests a more chronic condition. Aorta, trauma. Left anterior oblique (40°) angiogram shows spontaneous rupture of the isthmus, a mycotic aneurysm secondary to Salmonella pneumonitis infection. 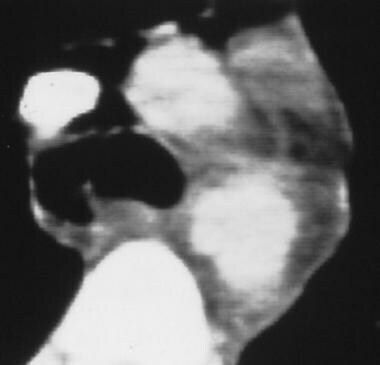 An isthmus outpouching has reduced contrast enhancement and a slightly irregular contour and margins in comparison with the surrounding aorta. This appearance is indistinguishable from that of a traumatic pseudoaneurysm. Aorta, trauma. Left anterior oblique (LAO) (30°) angiogram shows a tear on the undersurface of the aortic arch. This case is unusual in that the oblique view fails to demonstrate all of the patient's injuries. This moderate LAO view demonstrates only the atherosclerotic and hypertensive changes. Aorta, trauma. Left anterior oblique (4°) angiogram shows a tear on the undersurface of the aortic arch. 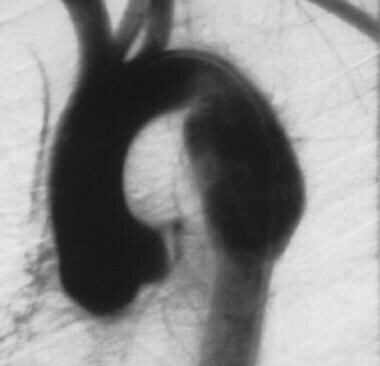 This nearly posteroanterior (PA) view demonstrates a small but definite irregular and hypodense pseudoaneurysm extending from the undersurface of the aortic arch. This case illustrates the need for multiple angiographic projections before the findings can be declared normal. Aorta, trauma. 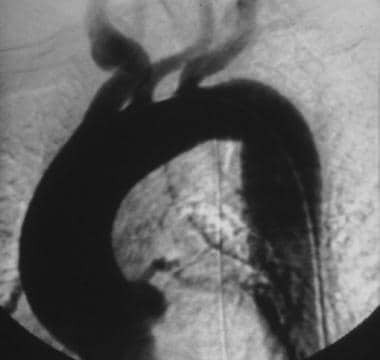 Angiogram shows a focal isthmus traumatic pseudoaneurysm. This example demonstrates an anteromedial bulge, intimal flap, acute-angle transition, irregular contour, and contrast-material hang up in this 45-year-old female patient. Aorta, trauma. Left anterior oblique (30°) angiogram shows atherosclerosis without an aortic injury. No focal variation in the atherosclerotic pattern is present to suggest injury. Aorta, trauma. Left anterior oblique (45°) angiogram shows a normal bronchointercostal artery with a ductus diverticulum. The initial image in this young female patient who was injured in a motor vehicle accident shows a possible contour abnormality in the region of the isthmus. Aorta, trauma. Left anterior oblique (70°) angiogram shows a normal bronchointercostal artery with a ductus diverticulum. The anteromedial isthmus outpouching is asymmetrical, with a questionable distal irregularity. The differential diagnosis includes ductus diverticulum and traumatic aortic injury (TAI). Aorta, trauma. Lateral digital subtraction angiogram shows a normal bronchointercostal artery with a ductus diverticulum. The anteromedial isthmus outpouching is asymmetrical, and a right-angle transition is depicted proximally. The margins are smooth, and no hang up is shown. Because of the severity of the patient's other injuries, surgical exploration was recommended. During surgery, a normal isthmus region was found. Aorta, trauma. Anteroposterior digital subtraction angiogram shows a subtle isthmus pseudoaneurysm. The image demonstrates no abnormality. Aorta, trauma. Left anterior oblique (45°) angiogram shows a replaced origin of the left vertebral artery. Familiarity with normal variants such as this aortic origin of left vertebral artery is essential. Clinical Case Analyze This Image: Diastolic Signal -- Systolic Diagnosis?